TheRustedChain - The Blog: You've been outs'mored. I didn't set out with the intent to outs'more Nic, but I thought of her the other day as I made my s'more with a Reese's Peanut Butter cup rather than the typical chocolate bar. I went with the traditional graham cracker and toasted marshmallow though. And it was divine! So can you outs'more me or Nic? I dare you to do it. Blog about it. Consider yourself tagged with this challenge. I'd love to see what you all come up with! Gonna get my brain to working on something. Oh my, this looks so good..
Now you've made me hungry. Oh my...that looks very yummy!!! Hmmmm...how can I outs'more that?? wow smores are my favorite! I have to try this! thanks for the idea :) beautiful pictures btw. Oh man, I have to say that I think you beat Nic (sorry Nic!!) But anything with Reese's, YUM!!! Carmelloa bars make FANTASTIC Smores.... you'll have ot try that next time. the carmel with the chocolate and marshmellow are heaven sent and in the winter time we use york peppermint patties.. TASTY! 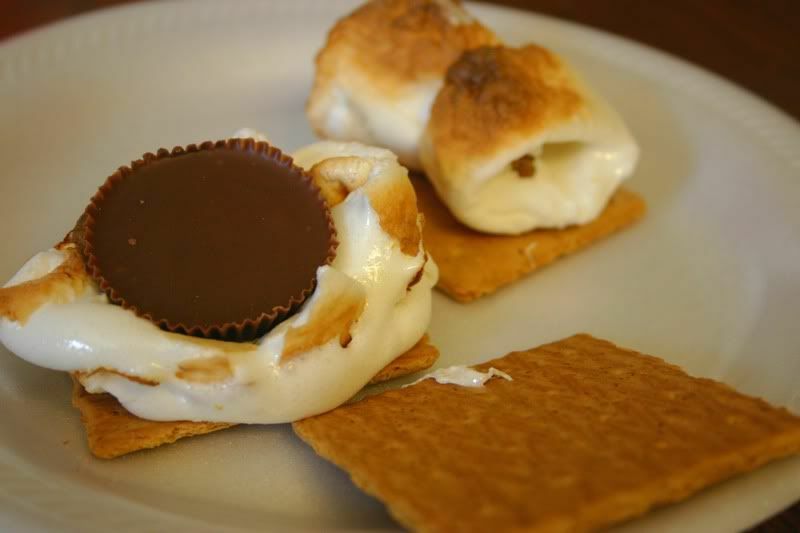 Finally something else you might live take a flour tortilla put chocolate chips, mini marshmellows and cut up candy bar peieces (we love snickers)on it and then wrap in alummin foil and broil or put in the coals of a camp fire until warm and melted.. YUMMY!!!! It is also good with sliced bananas in it. enjoy!